Covers three of the most famous, historically recorded plagues of the ancient world, the plague of Athens (430- 426 BC) described by Thucydides, the Antonine Plague (166- 270 AD) described by Galen and the Justinian Plague (542- 590 AD), described by Procopius. 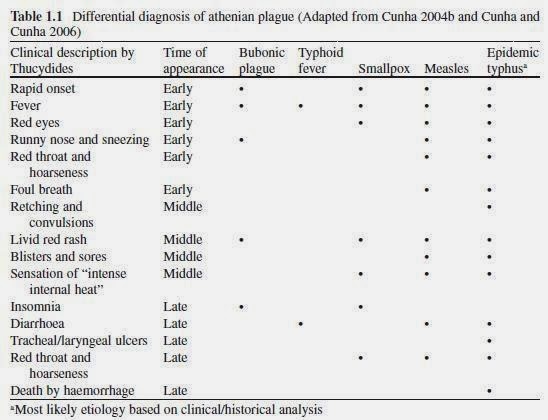 Cunha et al (2008) have produced tables of the features of descriptions of the three plagues and attempted to give a most probably cause on the basis descriptions match to the etiology of known infectious disease. Of the diseases described, the symptoms of the Antonine plague seem the most precise and objective, it is written by Galen and it describes an exanthema covering the whole body and the blood content of blisters. “Putrified blood like some ash which nature had deposited on the skin” and the healing process,” where part of the surface called the scab fell away and then the remaining part nearby was healthy” . Galen describes the course of the disease, for a surviving patient, through the experience of a young man. On the basis of Galen’s description Cuhna et al (2008) indicates that the Antonine Plague was probably small pox spreading through immunologically naive populations, the recurrence of the plague was its spread to populations previously unexposed. The description of the Justinian Plague by Procopius reliably indicates that it was Yersinia pestis, with the revealing description of bubonic swellings developed in the groin of the body, armpit, behind the ear and along the thighs. Procopius writes without the theories or the medical agenda of Galen and gives a general account of the relayed symptoms and hypothesized history, describing the failure of physicians in making an accurate prognosis of the course of the disease for many patients. In this way Procopius’s archive allows the most reliable diagnosis of the three. 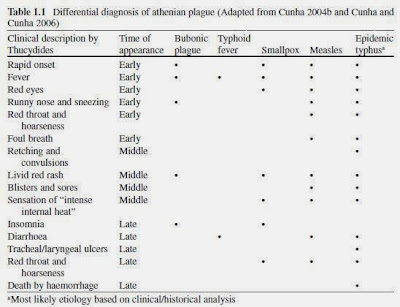 The description provided Thucydides is regrettably inconsistent with one disease cause, though Thucydides experienced the disease himself, the descriptions he provides seems to describe several disease states but Cuhna et al (2008) give a best fit of epidemic typhus, the causative organism Rickettsia prowazekii. In each of the great plagues described there have been significant repercussions that have potentially affected the course of history. Athens, without the plague may have won the Peloponnesian War, without the Antonine plague Rome may not have had the loss of manpower and may have solved the crisis seen in third century differently and without the Justinian Plague the Eastern Roman Empire may have had a longer lasting restoration of the west in the 7th Century. The plagues in retrospect can be seen to be the products of their host societies situations and successes. Increased population movement, long distance infrastructure, war time conditions and trade networks facilitated the spread of disease. Cunha, Cheston B & Cunha, Burke A. (2008). Great Plagues of the Past and Remaining Questions. In D. Raoult & M Drancourt (eds). Paleomicrobiology: Past Human Infections. Published by Spring-Verlag Berlin Heidelberg. Pages 1- 20.